UXD — or user experience design — seems to be gaining more significance in the public eye more than ever, but it might be nothing new if we survey back to thousands of years ago. Having assumed different names over time — product design, industrial design, interaction design, etc. — today’s UXD touches on every type of design we encounter. The rising interest in UXD today is more about the triumph of human-centric, iterative, metric-driven methodology popularized by “Design Thinking”: a human-centered approach to innovation widely used in the consumer technology industry. User experience design has its roots dating back to caveman age, when our ancestors invented pictogram to solve communication problems. Much like today’s icon design, pictograms are design to be universally comprehensible and easily learnable. Moving on to the 15th century, “user experience design” as creative problem solving first expressed itself as an invented artifact when Johannes Gutenberg nailed UXD in the head with his movable type. This revolutionary invention made the printed press both more efficient and satisfactory, heralding a new era of mass communication. Think about it: the movable letters are a ingenious goal-driven designsolution that made the printing process much faster, more efficient, and enjoyable for humans. It is one of the first examples of human-centric design: a solution focused on solving a problem with a machine that is easy to use and delivers a lot of value for user. Many people are already aware of the iconic User experience moments in design history, such as Henry Dreyfuss’ model 302 phone in the 1930s, and Dan Norman’s publication of “Design of Everyday Things” in 1988 that put “user experience design” on the map as a serious discipline. This article by Fast Company gives a pretty good overview of UX history. Have a read. Here I want to examine the lesser known moment in the history of user experience design, for the sake of diversifying the narrative around UX. The more examples we can look at, the more inspirations designers can draw from, right? Before computers existed, we had always been using the QWERTY keyboard layout for faster and easier typing. Invented by Christopher Latham Sholes, the QWERTY layout was a design solution to avoid letter jamming and typing mistakes. 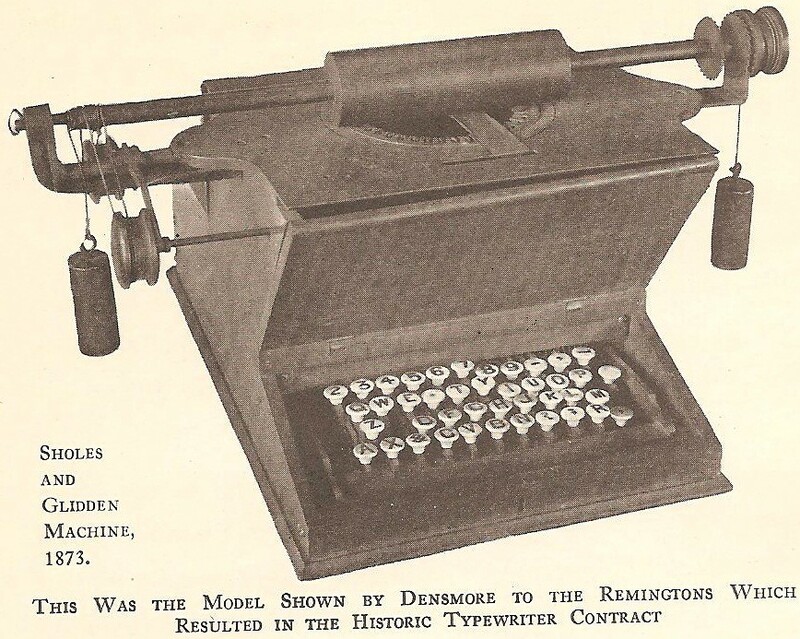 By placing commonly used letter-pairs together such as “th” or “st”, the QWERTY keyboard enabled writers to type faster without having to re-invent the typewriter itself. The QWERTY solution is based on empirical observation of flaws in the typing workflow, and its optimal letters arrangements are based on many years of trial-and-error — textbook definition of the “design thinking” methodology right there. Many inventors were credited with invention of wireless communication technology, but the two-way-telephone as an early example of human interaction design showcase how a tool can be designed for human to help enable a more efficient process. 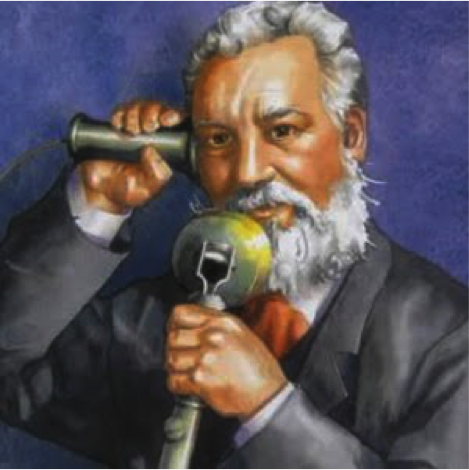 There are some controversies over the ownership of the two-way telephone invention, Alexander Graham Bell is generally considered the first to have created the two-way, voice-based telephone. 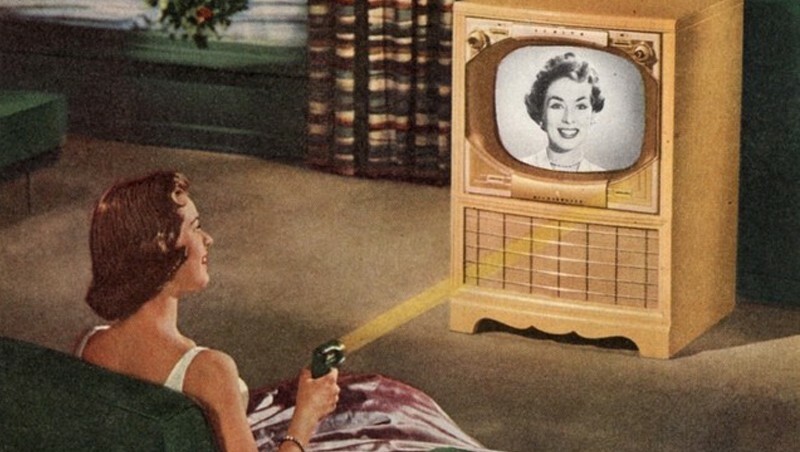 It changed the way humans physically interact with a tool to communicate. Think about it: how we play around with mobile phones today hasn’t changed all that much from the way humans interacted with an ear piece. Mobile apps might be recent, but our habit of pressing buttons to browse options wasn’t invented yesterday. First invented by Eugene Polley, the wireless remote control made user control a universal convention for interface design. The wireless remote is evolved from telephone’s rather limited ways for human-device interaction, and presented full customisation options. Users can adjust color, brightness, volumn and channel settings. If the two-way telephone is more task-oriented, wireless remote control is a combination of functionality and delight. 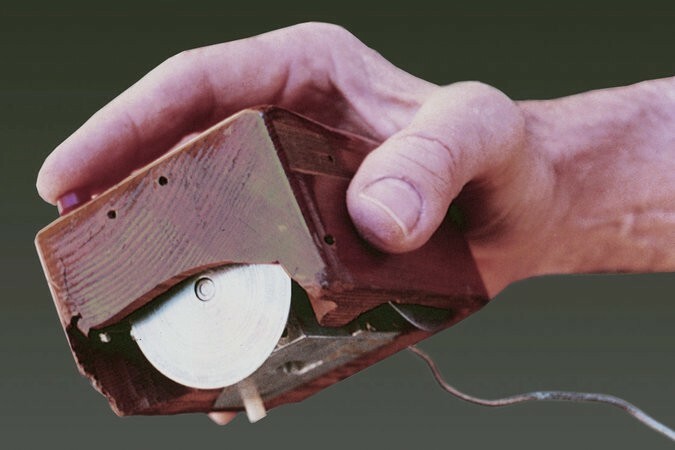 A tiny step forward just over half a century ago, Doug Engelbart’s mouse marked a new beginning in interface design that heralded mass adoption of human-computer interactions. While computers are sill room-sized monsters at Engelbart’s time, he envisioned a future of shared information networks that would raise our “collective IQ”. What Engelbart showcase to the computer world in 1968 was more than a mouse; it was a means to control a “windowed interface” where users can create hyperlinks, edit text, even video conferencing. What a visionary! Moreover, the mouse was designed to be used intuitively. Based on rather childlike eye-hand coordination, the mouse is designed to be very easy and intuitive to use: a bold concept at a time when one needs type obscure command line codes to access a simple system directory. Although the computer mouse only became a household item in the late 80s, its impact on the computer engineering world was more immediate. We will elaborate on that below. Much of Doug Engelbart’s visionary inception of the modern desktop computer — an interactive, networked computer system with a graphical interface controlled by the mouse and keyboard — led to the eventual advent of of GUI (graphical user interface). In 1973, Xerox PARC introduced the first-ever GUI for research use. Althogh these bitmap images look primitive now, at the time having windows and text editor was groundbreaking! In 1981, the Xerox Star became the first commercial desktop computer with applications and a GUI. This marks the beginning of modern user experience design — the GUI introduced a very important UXD requirement especially for software and app designs: Direct Manipulation. From here on, millennials like me are pretty familiar with the rest of user experience design history: Apple Macintosh, iPod, touchscreen smart phones, VR games, etc. History at its best illuminates the path forward: no doubt that UX breakthroughs in technology will happen even faster and on a more grand scale. One thing that remains the same regardless of how much advancement technology bring us: at the heart of it all, tools are invented to serve humanity’s needs to communicate, connect and collaborate. 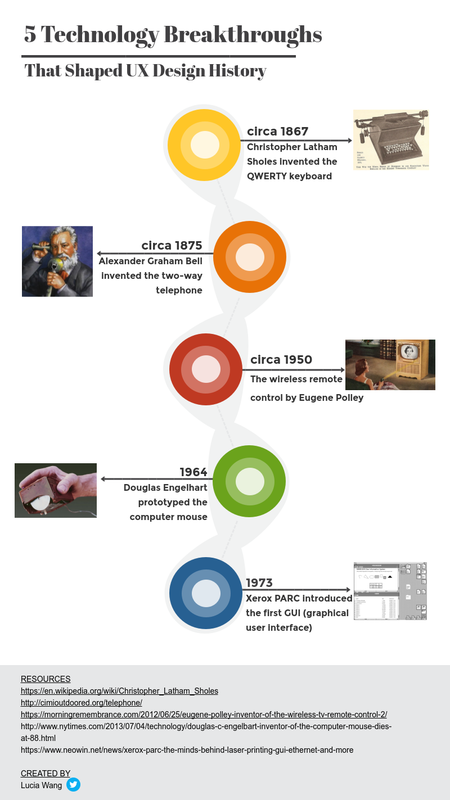 I created a timeline graphic for east visual reference, using a very neat infographic tool Visme. Using their preloaded timeline template, I spent no more than a couple minutes populating text and images.